M-RAC project is an Open Source and Open Hardware Robot Arm Control with multiple control interfaces: button shield, Web, Android. It’s based on the OWI Robotic Arm Edge, where the electronic is replaced with an UDOO Quad Board and a dedicated Motor Shield designed and produced using Orcad Capture and Orcad Layout Plus Software. The Robotic Arm is with 3 degrees of freedom and can take little objects. By an Android Application that run directly on UDOO with a 7” display touch or remotely on an Android Tablet an Smartphone. M-RAC explain how to control a Robotic Arm with multiple modalities, in particularly remotely (Internet/Intranet) and with an Android App. 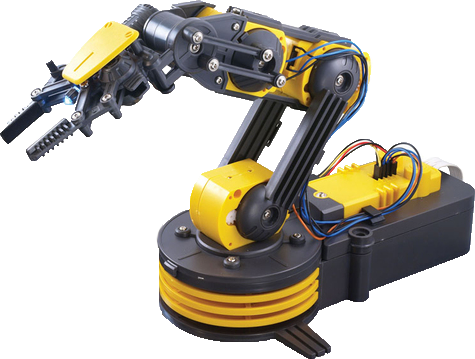 The project is Open Source and Open Hardware and can be replicated with professional Robot Arm. The Shield's project requires Orcad Capture and Orcad Layout Plus Software. You can download the project's files directly from this page. The Button Shield's project requires Orcad Capture and Orcad Layout Plus Software. You can download the files directly from this page. The Web interface requires some libraries for Linux directly GPIO manipulation (node-udoo). You can download them from terminal (Alt+F2 - xterm).